Orchids can be easily infected with various fungi or bacteria as the moist and humid environment required for their optimum growth also provide prime conditions for the growth of these infections. Different types of fungal and bacterial diseases have different impacts on orchids; therefore it is essential to determine what type of problem is distressing the plant. The best way to treat bacterial infection is to remove the infected area using sterile instruments immediately upon finding out. 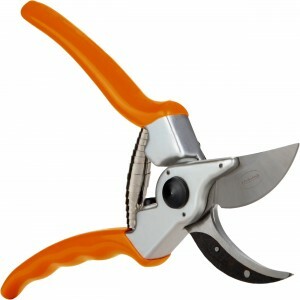 (A great tool is these pruning shears.) The entire growing area should also be disinfected with a 10% bleach solution. In addition to the removal, a good bactericide should be sprayed on the affected plant as well as all nearby plants in order to stop the infection from spreading. As bacterial diseases spread through water, it is important to avoid using an overhead watering system when a plant becomes infected. In addition to that it is best to keep leaves dry, reduce humidity levels in the growing area and improve air flow to contain the infection from spreading. Fungal infections are very diverse in nature and can affect the leaves, roots or the flower of the plant. That is why it is essential to figure out what type of fungal infection you are dealing with before determining the proper way to treat it. Cercospora, septoria, guignardia and phyllosticta are 4 types of fungal infections commonly referred to as leaf spots. It is important to remove the leaves which become infected using sterilized equipment. In addition to the removal, the leaves should be kept dry and water should not be allowed to accumulate on them. It is vital to use good quality protectant and systemic fungicides alternately. Sometimes, these fungal diseases become a recurring problem which is why it’s best to use a fungicide spray on a monthly basis in order to reduce the risk of recurring fungal infections. Botrytis commonly known as petal blight is another fungal infection which plagues orchids. To treat your orchid plant, it is important to remove the flowers which become infected. Spraying the contaminated plant as well as the surrounding ones with a good protectant fungicide also helps to reduce this infection. Since this is a very common fungus, there is no way to completely eliminate it, but proper care and sanitation, low humidity, warm temperatures and improved air flow in the growing area can substantially lower the damage caused by this fungus. Rhizoctonia is a fungal infection which debilitates the roots and also affects the leaves to a certain extent. It is important to remove the parts of the roots and leaves which are infested and the remaining plant should be soaked completely with a protectant fungicide. The growing area should be disinfected with a 10% bleach solution. Since root rot cannot be seen on a daily basis, it is important to repot your plants on a regular basis using fresh potting mix. This will allow you to inspect the roots carefully. If a plant in your growing area is infected, then it is best to check other plant’s roots as well and repot if necessary. Anthracnose is another fungal infection which usually affects the air borne parts of the plant, mostly the leaves. In order to treat your plant it is important that you apply a protectant and a systemic fungicide alternately to the entire plant. This fungus culminates in warm and humid weather when there is not enough light. If one of the plants in the growing area is infested then it is important to improve the air flow, increase the amount of light and lower the temperatures in the entire area to avoid the disease from spreading. Fusarium wilt is an infection which enters through the roots or the bulbs of the orchid. It is quite common in newly divided plants and cuts off the flow of water through the veins of the plant. That is why the leaves become shriveled and wilted. If the disease spreads through the plant to a greater extent the entire bulbs turn purplish and therefore should be removed from the plant. The plant should be repotted, keeping only the unaffected parts and removing all diseased parts. The repotted plant should be soaked in a fungicide and the entire growing area should be disinfected. The cutting tools must be thoroughly sterilized every time they come in contact with an infected part otherwise the infection can spread. Whether it is a fungal infection or a bacterial one, it is always better to maintain good hygiene and avoid infection rather than treating it. However, if your plants do get infected, it is essential to handle them properly to eliminate the problem and reduce it from recurring. Do you have a ninja trick for bacterial or fungal infections? Leave a comment below and tell us about it. Are your orchids beyond repair? Find out with this article. « Help! My Orchid Was Damaged by the Heat! I bought a dendrobium 3 weeks ago. It is in coconut husk. I mean literally. It is a whole coconut shell and the roots are growing all through it. It has some spots on the leaves when I got it, but I wanted to save the beautiful flowers. I still have 10 beautiful lavender striped flowers. I treated it with Hydrogen peroxide. I did not even try to repot yet. HOW can I do this? i bought a phalaenopsis two months ago & was fine. but 10 days ago i notice a pale yellow color on my crown leaf & in lower part of the leaf it look like water soaked effect. then i apply cinamon & hydrogen peroxide. but the leaf become darker & fizz. today when i pull the leaf gently it detached from the plant. what should i do now.. can u plz help??? I am living in gulf country and temperature is very during summer(45 to 55%) and its end by end of this month.can u suggest me the repotting media and its kept inside by house. Hello, I am really worried about my orchid because it’s got something that is killing its leaves and I don’t know what it is, neither what to do. Is there a way I can send you 2 pictures for you to see how it begins and evolves? I want to know how to save my little plant! I have recently (2 weeks ago) acquired a NOID dendrobium, most likely a ‘Pixie Princess’. From what I’ve learned so far, they are evergreens and don’t usually shed a lot of leaves at a time, when everything is right. But mine seem to be shedding leaves through yellowing, just from the old canes though. Has 12 canes in total- including two new shoots, another young shoot growing new leaves. It has just finished flowering and preparing to flower again! Sits by a southern window (has a veranda in between, so semi-bright location). Is this normal behavior? Am I doing anything wrong? It has lost about 3 leaves till now and has three more yellowing off now!